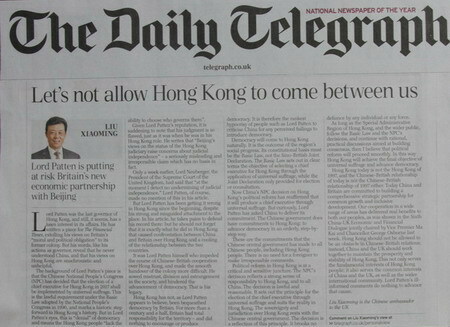 The Daily Telegraph carries Ambassador Liu Xiaoming's article on HongKong: "Let's not allow Hong Kong to Come Between us"
Lord Patten was the last Governor of Hong Kong, and still, it seems, has a keen interest in its affairs. He has written a piece for The Financial Times, extolling his views on Britain's "moral and political obligation" to its former colony. But his words, like his actions as Governor, reveal that he never understood China, and that his views on Hong Kong are anachronistic and unhelpful. The background of Lord Patten's piece is that the Chinese National People's Congress (NPC) has decided that the election of a Chief Executive for Hong Kong in 2017 may be implemented by universal suffrage. This is the lawful requirement under the Basic Law adopted by the National People's Congress in 1990, and marks a historic step forward in Hong Kong's history. But in Lord Patten's eyes, this is "denial" of democracy and means the Hong Kong people "lack the ability to choose who governs them". Given Lord Patten's reputation, it is saddening to note that his judgment is so flawed, just as it was when he was in his Hong Kong role. He writes that "Beijing's views on the status of the Hong Kong judiciary raise concerns about judicial independence" - a seriously misleading and irresponsible claim which has no basis in fact. Only a week earlier, Lord Neuberger, the President of the Supreme Court of the United Kingdom, had said that "at the moment I detect no undermining of judicial independence." Lord Patten, of course, made no mention of this in his article. But Lord Patten has been getting it wrong in Hong Kong since the beginning, despite his strong and misguided attachment to the place. In his article, he takes pains to defend his record there: but he should not forget that it is exactly what he did in Hong Kong that caused confrontation between China and Britain over Hong Kong and a cooling of the China-UK relationship between the two countries. It was Lord Patten himself who impeded the course of Chinese-British cooperation over Hong Kong, and made the smooth handover of the colony more difficult. He sowed mistrust, division and estrangement in the society, and hindered the advancement of democracy. That is his legacy. Hong Kong has not, as Lord Patten appears to believe, been bequeathed democracy by Britain. For more than a century and a half, Britain had total responsibility for the territory - and did nothing to encourage or produce democracy. It is therefore the rankest hypocrisy of people such as Lord Patten to criticise China for any perceived failings to introduce democracy. Democracy will come to Hong Kong naturally. It is the outcome of the region's social progress. Its constitutional basis must be the Basic Law, not the Sino-British Joint Declaration. The Basic Law sets out in clear terms the objective of selecting a Chief Executive for Hong Kong through the application of universal suffrage, while the Joint Declaration only provided for election or consultation. Now China's NPC decision on Hong Kong's political reform has reaffirmed that it will produce a Chief Executive through universal suffrage. But curiously, Lord Patten has asked China to deliver its commitment. The Chinese government does have commitments to Hong Kong: to advance democracy in an orderly and step-by-step way. These are the commitments that the Chinese central government has made to all Chinese people, including Hong Kong people. There is no need for a foreigner to make irresponsible comments. Political reform in Hong Kong is at a critical and sensitive juncture. The NPC's decision reflects a strong sense of responsibility to Hong Kong, and to all China. The decision is lawful and reasonable. It sets out the principle for Chief Executive through universal suffrage and suits the reality in Hong Kong. The sovereignty and jurisdiction over Hong Kong rests with the Chinese central government. The decision is a reflection of this principle. It brooks no defiance by any individual or any force. As long as the Special Administrative Region of Hong Kong, and the wider public, follow the Basic Law and the NPC's decisions, and continue with rational, practical discussions aimed at building consensus, then I believe that political reform will proceed smoothly. In this way Hong Kong will achieve the final objective of universal suffrage and advance democracy. Hong Kong today is not the Hong Kong of 1997, and the Chinese-British relationship of today is not the Chinese-British relationship of 1997 either. Today China and Britain are committed to building a comprehensive strategic partnership for common growth and inclusive development. Our cooperation in a wide range of areas has delivered real benefits to both our peoples,as was shown in the Sixth China-UK Economic and Financial Dialogue jointly chaired by Vice Premier Ma Kai and Chancellor George Osborne last week. Hong Kong should not be allowed to be an obstacle in Chinese-British relations; instead, China and UK should work together to maintain the prosperity and stability of Hong Kong. This not only serves the fundamental interests of Hong Kong people; it also serves the common interests of China and UK as well as the wider international community. Lord Patten's ill-informed comments do nothing to advance that cause.